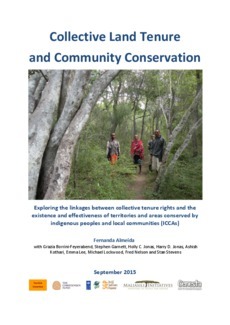 This paper analyzes the importance of legal recognition of collective tenure rights (including to customary land and sea tenure) of indigenous peoples and local communities for the survival and thriving of their conserved territories and areas (ICCAs); the importance of legal recognition of ICCAs for their conservation values; and the relationship between the two. It begins by providing a description of the broader context of how the legal recognition of both collective tenure rights and territories and areas conserved by peoples and communities contributes to the conservation of nature (Section 2). Secondly, it presents a methodological framework and applies it to five selected countries. The proposed framework includes four different categories of areas considering the overlap between collective and customary control, community conservation and legal recognition. It also evaluates legal recognition of both collective tenure and ICCAs in at least four aspects: a) types of rights recognized; b) types of resources over which rights are recognized; c) recognition of the right to self-governance; and d) implementation of legal recognition in terms of hectares of land officially recognized (Section 3). Section 4 presents some lessons learned and conclusions, and Section 5 presents legal and policy recommendations for securing ICCAs based on the findings. Overall, this paper concludes that a necessary step for the effective recognition and thriving of ICCAs, and for conservation itself, is the implementation of legal reforms appropriately recognizing collective tenure rights of indigenous peoples and local communities within but also beyond conservation and protected area laws and policies.